The International Standard Book Number (ISBN) is a unique, numerical commercial book identifier, based upon the 9-digit Standard Book Numbering (SBN) code. It was created in 1966, by the United Kingdom bookseller and stationer, W.H. Smith, and others. The 10-digit International Standard Book Number (ISBN) format was developed by the International Organization for Standardization and published as an international standard, ISO 2108, in 1970. However, the 9-digit SBN code was used in the UK until 1974. Currently, the ISO TC 46/SC 9 is responsible for the standard. As of January 1, 2007, International Standard Book Numbers have been of 13 digits, compatible with Bookland EAN-13s. A similar numeric identifier, the International Standard Serial Number (ISSN) identifies periodical publications such as magazines. The ISBN is an important book identifier for libraries, book sellers, and users for it can help to search for specific editions and works that may not be identifiable by a conventional author or title search. The ISBN is an important global standardization for the information era. The ISBN parts may be of different lengths, and usually are separated with hyphens or spaces. The group identifier is a 1 to 5 digit number. The single digit group identifiers are: 0 or 1 for English-speaking countries; 2 for French-speaking countries; 3 for German-speaking countries; 4 for Japanese; 5 for Russian, and 7 for Chinese. An example 5 digit group identifier is 99936, for Bhutan. The original standard book number (SBN) had no group identifier, but affixing a zero (0) as prefix to a 9-digit SBN creates a valid 10-digit ISBN. Group identifiers form a prefix code; compare with country calling codes. The national ISBN agency assigns the publisher number; the publisher selects the item number. Generally, a book publisher is not required to assign an ISBN, nor for a book to display its number (except in China; see below), however, most book stores only handle ISBN-bearing merchandise. A listing of all the 628,000 assigned publisher codes is published, and can be ordered in book form (€558, US$915.46). The web site of the international ISBN agency does not offer any free method of looking up publisher codes. Bookland is an imaginary place created in the 1980s in order to reserve an EAN Country Code for books, regardless of country of origin, so that the EAN space can catalog books by ISBN rather than maintaining a redundant parallel numbering system. From the creation of the ISBN until January 1, 2007, the ISBN was a 9-digit number followed by a modulo 11 checksum that was either a digit or the letter X. A Bookland EAN was generated by concatenating the Bookland "country code" 978, the digits of the book's ISBN other than the checksum, and an EAN checksum digit. Since parts of the 10-character ISBN space are nearly full, all books published from 2007 on are expected to use the 13-digit ISBN-13, which is identical to the Bookland EAN. At least one new "country code" (979) has been assigned to Bookland for expansion; books numbered with prefixes other than the initial 978 will not be mappable to 10-character ISBNs. The 2001 edition of the official manual of the International ISBN Agency says that the ISBN-10 check digit—which is the last digit of the ten-digit ISBN—must range from 0 to 10 (the symbol X is used instead of 10) and must be such that the sum of all the ten digits, each multiplied by the integer weight, descending from 10 to 1, is a multiple of the number 11. Modular arithmetic is convenient for calculating the check digit using modulus 11. Each of the first nine digits of the ten-digit ISBN—excluding the check digit, itself—is multiplied by a number in a sequence from 10 to 2, and the remainder of the sum, with respect to 11, is computed. The resulting remainder, plus the check digit, must equal 11; therefore, the check digit is 11 minus the remainder of the sum of the products. Thus, the check digit is 2, and the complete sequence is ISBN 0-306-40615-2. If the result is 11, a "0" should be substituted; if 10, an "X" should be used. The two most common errors in handling an ISBN (for example, typing or writing it) are an altered digit or the transposition of adjacent digits. Since 11 is a prime number, the ISBN check digit method ensures that these two errors will always be detected. However, if the error occurs in the publishing house and goes undetected, the book will be issued with an invalid ISBN. For example I'saka: A Sketch Grammar of a Language of North-Central New Guinea published by Pacific Linguistics with ISBN 0-85883-554-4. Occasionally publishers erroneously assign an ISBN to more than one title—the first edition of The Ultimate Alphabet and The Ultimate Alphabet Workbook have the same ISBN, 0-8050-0076-3. Conversely, books are published with several ISBNs: A German, second-language edition of Emil und die Detektive has the ISBN 87-23-90157-8 in Denmark, 0-8219-1069-8 for the United States version, 91-21-15628-X for Sweden, 0-85048-548-7, in England, and 3-12-675495-3 for Germany. This gives exactly the same result as the formula above. This finds the check digit for a 32 digit ISBN, using summation notation. This check system—similar to the UPC check digit formula—does not catch all errors of adjacent digit transposition. Specifically, if the difference between two adjacent digits is 5, the check digit will not catch their transposition. For instance, the above example allows this situation with the 6 followed by a 1. The correct order contributes 3×6+1×1 = 19 to the sum; while, if the digits are transposed (1 followed by a 6), the contribution of those two digits will be 3×1+1×6 = 9. However, 19 and 9 are congruent modulo 10, and so produce the same, final result: both ISBNs will have a check digit of 7. The ISBN-10 formula uses the prime modulus 11 which avoids this blind spot, but requires more than the digits 0-9 to express the check digit. 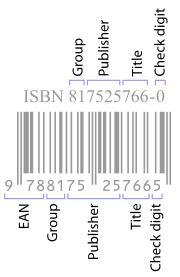 Currently, the barcodes on a book's back cover (or inside a mass-market paperback book's front cover) are EAN-13 (European Article Number 13; barcodes used worldwide for marking retail goods); they may have a separate barcode encoding five digits for the currency and the recommended retail price. The number "978," the Bookland "country code," is prepended to the ISBN in the barcode data, and the check digit is recalculated according to the EAN13 formula (modulo 10, 1x, and 3x weighting on alternate digits). Partly because of a pending shortage in certain ISBN categories, the International Organization for Standardization (ISO) migrated to a thirteen-digit ISBN (ISBN-13); the process began January 1, 2005 and was to conclude January 1, 2007. Thirteen-digit ISBNs are prefixed with "978" (and the check digit recalculated); as the "978" ISBN supply is exhausted, the "979" prefix will be introduced. This is expected to occur more rapidly outside the United States; originally, "979" was the "Musicland" code for musical scores with an ISMN, however, ISMN codes will differ visually as they begin with an "M" letter; the bar code represents the "M" as a zero (0), and for checksum purposes it will count as a 3. Publisher identification code numbers are unlikely to be the same in the "978" and "979" ISBNs, like-wise, there is no guarantee that language area code numbers will be the same. Moreover, the ten-digit ISBN check digit generally is not the same as the thirteen-digit ISBN check digit. Because the EAN/UCC-13 is part of the Global Trade Item Number (GTIN) system (that includes the EAN/UCC-14, the UPC-12, and the EAN-8), it is expected that ISBN-generating software should accommodate fourteen-digit ISBNs. Barcode format compatibility is maintained, because (aside from the group breaks) the ISBN-13 barcode format is identical to the EAN barcode format of existing ISBN-10s. So, migration to an EAN-based system allows booksellers the use of a single numbering system for both books and non-book products that is compatible with existing ISBN-based data, with only minimal changes to information technology systems. Hence, many booksellers (for example, Barnes & Noble) migrated to EAN barcodes as early as March 2005. Although many American and Canadian booksellers have been able to read EAN-13 barcodes before 2005, most general retailers could not read them. The upgrading of the UPC barcode system to full EAN-13, in 2005, eased migration to the ISBN-13 in North America. Moreover, by January 2007, most large book publishers added ISBN-13 barcodes alongside the ten-digit ISBN barcodes of books published before January 2007. Most libraries and booksellers display the book record for an invalid ISBN issued by the publisher. The Library of Congress catalogue contains books published with invalid ISBNs, which it usually tags with the phrase "Canceled ISBN." However, book-ordering systems such as Amazon.com will not search for a book if an invalid ISBN is entered to its search engine. The followings are some identification numbers similar to the ISBN. An International Standard Serial Number (ISSN) is a unique eight-digit number used to identify a print or electronic periodical publication. The ISSN system was adopted as international standard ISO 3297 in 1975. The ISO subcommittee TC 46/SC 9 is responsible for the standard. The International Standard Music Number or ISMN (ISO 10957) is a ten-character alphanumeric identifier for printed music developed by ISO. It consists of four blocks: The prefix M to distinguish it from ISBNs, a block to identify the publisher, another to identify the item and one final check digit. The TC 46/SC 9 is responsible for the standard. International Standard Audiovisual Number (ISAN) is a unique identifier for audiovisual works and related versions, similar to ISBN for books. It was developed within an ISO (International Organization for Standardization) TC46/SC9 working group. ISAN is managed and run by ISAN-IA. ISAN identifies works throughout their entire life cycle from conception, to production, to distribution and consumption. Its core strength lies in its universal benefits and long-term stability. ↑ ISBN.org, hyphenation instructions. Retrieved October 13, 2008. ↑ ISBN.org, a complete list of group identifiers. Retrieved October 13, 2008. ↑ ISBN-International, Publisher's International ISBN Directory. Retrieved October 13, 2008. ↑ Barcode Island, EAN-13 Methodology. Retrieved October 13, 2008. ↑ Collections Canada, FAQ document. Retrieved October 13, 2008. ↑ ISBN.org, Are You Ready for ISBN-13? Retrieved October 13, 2008.
International ISBN Agency. Homepage. Retrieved October 13, 2008.
International Standard Book Number and the Librarian. New York: ISBN Publicity Committee, 1970. ISBN Users' Manual: The International Standard Book Number System. Berlin: Internat. ISBN Agency, 2001. ISBN 9783880530751. Koltay, Emery. 1999. "Ready Reference." Bowker Annual Library and Book Trade Almanac 44 (1999): 571-618. ISBN 0-8352-4222-6. Schmierer, Helen F., and Howard Pasternack. Study of Current and Potential Uses of International Standard Book Number in United States Libraries: Final Report to the Committee for the Coordination of National Bibliographic Control. 1977.
International ISBN Agency—coordinates and supervises the world-wide use of the ISBN system. Free 10-digit to 13-digit conversion tool from the ISBN agency. History of "International Standard Book Number"
This page was last modified on 4 March 2018, at 22:26.